on Thursday, 07 December 2017. Prof. Francis Omaswa SpeakingThe Health Systems Advocacy Partners (ACHEST, HAI, Amref Health Africa and Wemos) convened for the second annual Joint Action Planning Meeting in Kampala at Hotel Africana from 28th-30th November 2017. 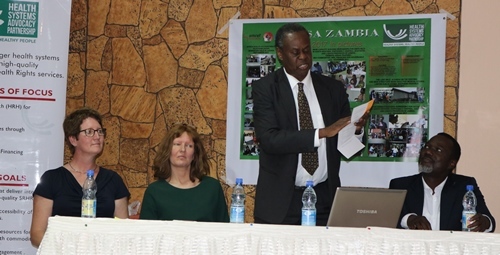 This meeting brings together the entire project implementing partnership team from all the eight contexts which include: Uganda, Kenya, Tanzania, Zambia, Malawi, the Africa Region, European Union and the Global Context. The main objective of the Joint Action Planning meeting was to review the outcomes of 2017 and fine-tune plans for 2018, with a specific focus on strengthening thematic linkages within and across contexts. The meeting was divided into three main sessions: Outcome harvesting where partners reflected on the outcomes for 2017 using the outcome harvesting methodology, planning for 2018 where partners reflected on how to strategically position themselves in 2018 to deliver the project and the joint advocacy efforts in which partners made reflections on advocacy efforts they could all contribute to and synergize given their unique niches and contributions to the programme. During the meeting, partners presented Master Class sessions in which best practices were shared by all partners while Poster sessions gave all participants opportunities to appreciate how each partner implemented activities in 2017. Guest speakers too were invited to make presentations on select topics that included: Dr. Obuku Okware, the President Uganda Medical Association (UMA) who shared on the UMA Industrial Action and Dialogue; Dr. Michael Bukenya, Chair of the Uganda Parliamentary Health Committee who presented on: Role of Parliament in the Realization of Universal Health Coverage, and Mr. David Walakira a representative from the Civil Society Budget Advocacy Group (CSBAG) who presented on Budget Tracking; Tools and Methods. The first speaker, Dr. Okware Obuku of UMA observed that the industrial action by the doctors that took three weeks before it was suspended was long overdue citing the governments’ failure to respond to the request made by the doctors for better working conditions and terms Dr. Michael Bukenya, Chair of the Parliamentary Committee who highlighted the roles of parliament as being appropriation, legislation and oversight for health in the national health budget, while Mr. David Walakira from CSBAG cited rigidity of some government departments in sharing budget information as a challenge in tracking the national budget. Frank van de Looij from the Dutch Ministry for Foreign Trade and Development emphasized the need for progress that should be made from learning from each other and contexts pledging that the Ministry too can help in pitching advocacy work where it would otherwise be difficult especially among embassies. The outcomes of the meeting included among others: refined project outcomes, shared work plans and reports of activities done in 2017. 3. Thematic linkages within and between contexts were established and all HSA partners discussed their roles and responsibilities agreements were made on way forward.